The recipe I’m sharing with you today is strange. 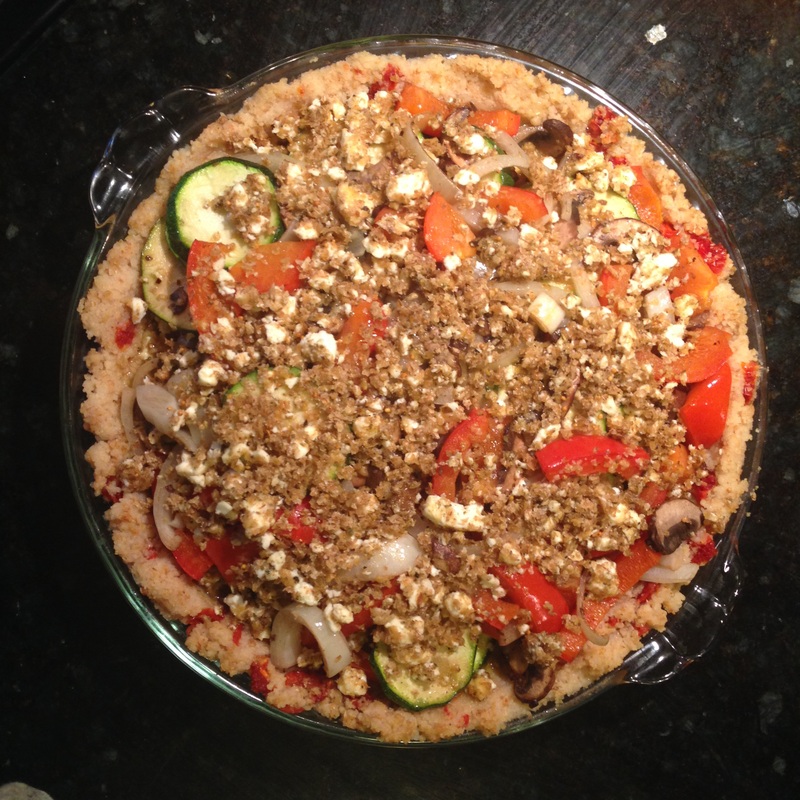 While it’s called a gratin, it’s really more of a vegetable pie in a couscous crust. I found it on the side of a jar of wheat germ seven or eight years ago, which is also strange. I mean, who buys wheat germ? And then there’s the fact that I still regularly buy wheat germ just to make this recipe that I’m not even that crazy about. So, why share it with you? It’s partly because Matt requested it this week, but mostly because it reminds me of another strangely delicious baked pasta dish that my grandma used to make for me: spaghetti pie. It was a little brown and crunchy-chewy around the edges and the bottom was dense with egg, topped with tomato sauce and a layer of melted cheese. I adored that spaghetti pie and I was always excited when I got to stay with grandma and grandpa because grandma would always make it for me. I liked it so much she shared the recipe with my mom, but it wasn’t quite the same if grandma didn’t make it. With both my dad’s birthday and father’s day a few days away, I’ve been thinking a lot about him lately. As an only child, I’m the only one who inherited my dad’s genes, just me. There’s no one else who inherited his quirks and habits, the shape of his chin, or his terrible eyesight, or his penchant for fiddle head ferns. This comes with a weighty sense of duty to do those genes justice, to find those strengths in myself that I inherited from him and let them shine. No one else can. As an only child, I also inherited a lot of dad’s things. His cookbooks, his pots and pans, his gold Cross pen with his name engraved on the side. Matt inherited his watch and a closet full of suits. Some of the suits are showing their age and some just don’t fit very well, so I pulled some from the closet to donate. “Are you sure you’re okay with giving these away?” Matt asked. I am completely sure. There’s nothing of dad in his things. (Except maybe his Red Sox cap. He wore that thing basically everyday, so that’s not being donated anytime soon.) Dad’s legacy is in my blood and my words and my actions. I’ve also been thinking a lot about grandma and not just her spaghetti pie, but those habits and qualities that dad inherited from her. Her addiction to crossword puzzles, her love of cooking good, simple food. Her humor and intelligence. Her need for routine and her weekly phone calls with her kids. I may not have siblings to remember my dad by, but I have something even better. I have grandma – the very source of all his awesomeness. Her presence, even though she’s several states away, is a huge comfort. And so, to celebrate dad and the wonderful woman who made him, I give you this strange vegetable pie (that’s only vaguely reminiscent of grandma’s spaghetti pie). Give it a whirl (if you’re willing to spend the rest of your life having to add wheat germ to your grocery list on a semi-regular basis). Or if you want to avoid that at all costs, make your own happy memory pie. Happy father’s day. Tags: pasta, pie, vegetables, vegetarian | Permalink.